The easiest way to enter Bhutan is by a Druk Air flight into Paro. Paro bound flights can be boarded on the national carrier at Bangkok, Dhaka, Calcutta, Kthmandu and Delhi. For the latest flight schedule of Druk Air , Please refer the Druk Air website, or we could even fax to you whenever you are! Visas are essential for entry into the kingdom, and this can be prearranged by Bae-Yul. Visa confirmations are communicated by Bae-Yul to the Druk Air office to enable the visitor to board the flight to Bhutan. 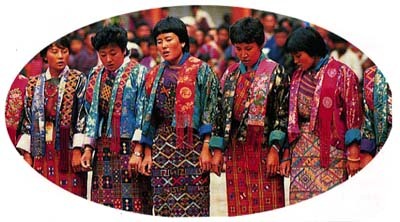 Upon arrival in Paro, the visas are issued and a fee of $20 is charged to all nationalities. In line with the royal government`s policy of cautious modernisation the number of visitors allowed into Bhutan is limited for any given year. The government regulations provide for a fixed daily rate which covers such expenses as hotels, meals, transport, guides etc. Visitors are put up in comfortable hotels and lodges which are available in almost all the places of visit covered in our programme. On the trekking routes purpose-built huts or tents generally form the mode of accomoation. Transportation is safe and comfortable in the form of buses and cars, imported from Japan and for the trekking equipment imported some from Nepal and most from U.S.A and Japan. Please make your booking three months before (at the latest) your arrival. We will get back to you with the itinerary and more details. The Bae-Yul team, with all its years and experience, awaits to serve you.